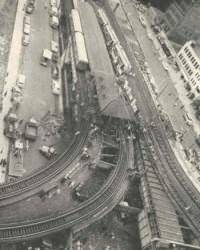 "Shortly after two o'clock June 11, the MTA was placed in an ear-shattering, explosive crucible. It was the kind of test the Authority hoped never to meet. Yet it met head-on a tragedy of staggering dimensions and emerged in stature and prestige. The overhead platform at the North Station blew apart, severing a vital link in the system's main line from Forest Hills to Everett. At first, no one seemed to know what had happened. Rumors sped throughout the city. Someone said a bomb exploded. Another said the electrical system failed in a flaming blast. Others said a gas line ignited. Others turned loose their imagination. The MTA knew one thing for sure. A tragedy had struck. People were hurt. It appeared that one or more might die. The MTA went to work. One of its lifelines was twisted out of operation, and hundreds of thousands of commuters immediately looked to the MTA for other means of transportation. At the North Station site, the MTA reorganized schedules of its buses and street cars to provide service over a network of alternate routes to care for the many riders who must, explosion or no explosion, move now. All the Trustees, Anthony D. Pompeo, Chairman, William V. Ward and John J. Graham, were at the scene to take personal charge of 'Operation Restoration.' Telephone lines from the explosion site to MTA headquarters were out, but an emergency method of communication was set up and the gigantic task of restoration got under way. Red tape was cut. Men and equipment were mobilized and sped to the scene. Meanwhile, scores of citizens, members of the clergy, servicemen, police, firemen, Red Cross workers, ambulance workers, hospital personnel, state, county, and city agencies, and others too numerous to list in this account, formed a small army of rescue workers. The shocked and injured men and women trapped in the debris were carried on stretchers to nearby hospitals. Quick thinking citizens performed first aid at the scene. An entire city seemed to respond in unison. Eventually, the last of the injured was removed. Thousands of curious dispersed. The excitement ebbed. As dusk stretched across the North Station, the MTA was left alone?alone amid a Gargantuan transportation task. 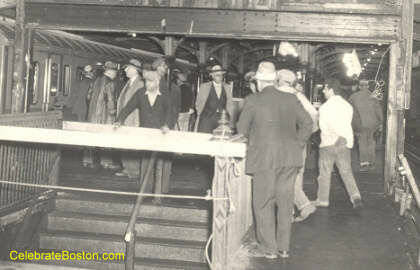 Colonel Erme B. Myott, Chief Engineer of the Authority, and hundreds of MTA workers, many of whom were off duty at the time, arrived voluntarily at the scene, and began the night long task of getting the North Station link back in operation. Meanwhile, over a local television channel, Edward Dana [MTA General Manager], his faith in his men unbounded, pulled a prediction out of the debris. He said that normal service would be resumed in the morning. Except for his men, few believed that a miracle could be wrought. By 5:31 a.m., the following morning (fifteen hours after the explosion), and after safety tests had been made, the first train moved over the structure. Metropolitan Boston was back in business. Apart from the personal loss and suffering involved, one indisputable fact emerged from the wreckage. The MTA accomplished one fine job. Approximately thirty-eight persons, some of them MTA personnel, were injured in the blast, three critically. Only one person died. MTA Inspector John T. Brown, 41, was fatally injured while doing his job. It was determined that the cause of the explosion was in no way connected to MTA operations." "The hunt for the person who hid the explosive charge in a locker was complicated by a hoax telephone calls of more bombs. A 23-year-old man who escaped June 9 from Harlem Valley State Hospital at Wingdale, NY, is being sought by the police. He is a former Boston man who was seized in New York April 24, when he found carrying a home-made bomb at a Central Park rally at which Cuban Premier Fidel Castro spoke. Boston Police, Fire department and State Police representatives announced at Boston Fire Department Headquarters that the blast yesterday had been caused by black powder. It is not known, the announcement said, what triggered the explosion , or what container was used by the bomb maker."